A wild day at Valencia saw several riders crash during a MotoGP race that was forced to restart with 14 laps remaining. Rain inundated the circuit during the first half of the race as numerous riders, including Marc Marquez (Honda) and Maverick Viñales (Yamaha) hit the deck. The rain became so intense that the race was red-flagged, and then restarted as a 14 lap sprint. On the restart, Alex Rins (Suzuki) was positioned at pole with Andrea Dovizioso (Ducati) second and Valentino Rossi (Yamaha) third. Those three quickly distanced the field and appeared on their way to podium finishes before Rossi crashed (eventually re-mounting to finish 13th). 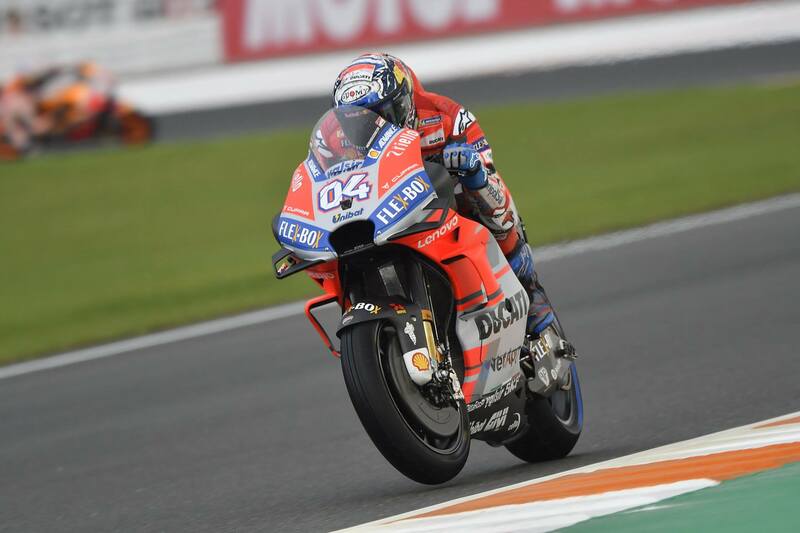 At the flag, it was Dovizioso taking the win ahead of Rins in second and Pol Espargaro (KTM) in third. Espargaro secured the first ever podium finish for KTM in the MotoGP category. This ends an exciting season dominated by Marc Marquez, who clinched the title with four races remaining. Going into 2019, Honda (with Jorge Lorenzo, who finished today’s race in 12th, joining Marquez as teammate), Yamaha, Ducati and Suzuki all look strong — with KTM finding the podium today just before Johann Zarco teams up with Pol Espargaro next year. Aprilia has an entirely new bike coming to hopefully become competitive next year. Testing for 2019 begins Tuesday at Valencia. Today also marked the end of the outstanding career of Dani Pedrosa (Honda), after many wins and countless podiums in the MotoGP class without ever taking the title. Pedrosa joins KTM as a test rider for 2019. It was a good season of racing, but with too many riders injured. Being a fan of both Rabat & Lorenzo, it was hard seeing the end portions of their 2018 seasons. I’m looking forward to the tests this week, and the upcoming racing season. Of course, we all know that sometimes the show outweighs the racing, but I still think that MotoGP is the best racing available for us couch potatoes. If everybody heals up over the winter, 2019 should be another great year for motorcycle racing fans. Anyone with a Evinrude or Mercury under them would’ve had a chance to get on the podium. Cracked up at the F-bombs launched by the KTM guys. Great qualifying and even better race. Congrats to Marquez for the championship and Dovi, Rossi, Rins, Crutchlow, Lorenzo, and a few others who really made it an entertaining season. Well now we know what it takes for KTM to get on the podium. Haters gonna hate hate hate. He high sided trading shots with Marquez, and the racing gods called a Mulligan for him. Whatever the causes, love it when circumstances allow for some variety on the podium. Great race!!! Many of the supposed best didn’t have “what it takes” to keep their bikes upright. He also qualified ahead of many front runners. This team is improving rapidly. No, they really aren’t improving, rapidly or otherwise. Wet-race results mean nothing, in terms of telling us how a bike and team are truly progressing. This is especially true in a deluge like today’s race, during which most of the usual frontrunners graciously crashed out, thus bumping everyone else up a good four or five spots. Check the season-long results for KTM in dry races. Not only did they get swamped, they may have actually regressed, compared to last year. If you want to see teams that are making real progress, look to Ducati, obviously, and Suzuki. Ducati is right there every week now. Suzuki is coming. Wet races erase an HP advantage and that’s it. He qualified 6h on the grid, which is very solid. He is two places higher in the standings this year than last, despite finishing two fewer races than last year. I agree that Ducati and Suzuki are on a march, though it’s also reasonable to say that Honda is regressing badly. If it weren’t for Marquez, they’d be nowhere (currently 7th and 11th) in the title chase. I have to agree with VLJ in this one. KTM just hasn’t made that much progress. This single race means nothing. Anyone who has ever raced in the rain knows that rain erases far more than a horsepower advantage. The significantly slower pace means that all of the refinement in the top machines that make them that much better at the limit never really come into play. KTM have improved. There was a time when Bradley Smith rarely ever even sniffed at the top 15. But it is slow progress and by no means impressive IMO. Poor Aprilia has taken two steps back. They’ve had a terrible season. Both teams really need to step it up. They both have fast riders signed for next year, so I hope that is a sign that they are really ready to get down to business. I think someone from Honda said the same thing about the KTM motocross effort once upon a time. C’mon, Kawasaki. Join in on the fun. I haved asked, believe me. They just keep saying no. Sorry to see the season end. It was a wild race. Congrats to Suzuki for a great year and to KTM for their maiden MotoGP podium.Thanks to all the teams and riders for another great season. Looking forward to next year. Can’t wait. KTM/reason – I’m thinking if nothing else it’s an interesting challenge, which the guy is probably ready for after so many years of kind of the same thing. The reason for KTM? I think cold turkey would be too much. Keeps him in the GP loop, at a capacity he can enjoy.